* I’m not actually sure if it has been exactly 100 days. it’s been three months and change, but saying 100 days just sounds so much cooler. 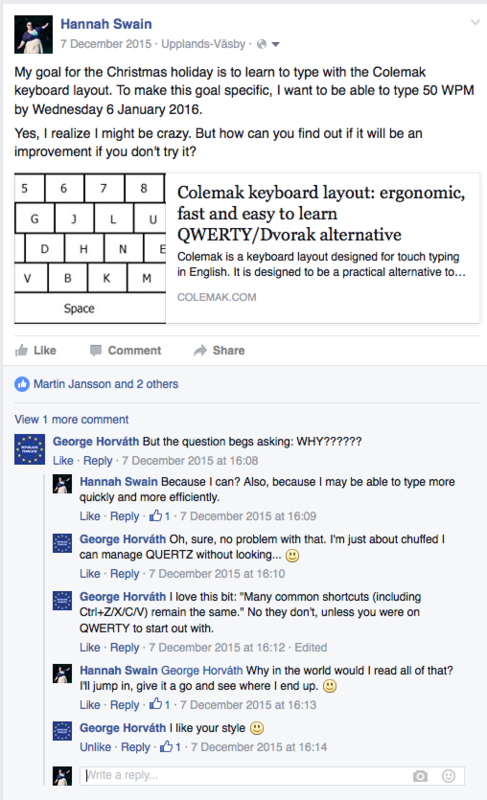 I could write a whole article on why I chose Colemak, why I tried Dvorak and what I learned about myself when I did it. Instead, I’m just going to celebrate. 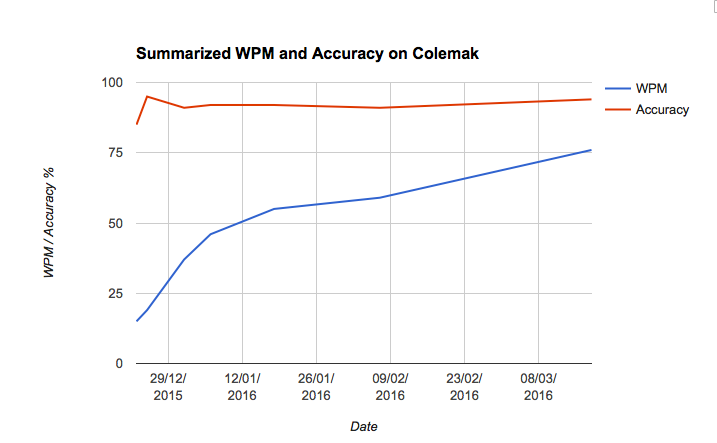 I really started on 23 December 2015 and my goal was to type 50 WPM before I went back to work after Christmas, so 6 January 2016. I put it on Facebook for accountability. Check the conversation with George – there’s yet another example of my “why not?” mentality. I started at about 13 words per minute and that was absolutely excruciating. On the evening of 6 January, I sat down to practice: I was so close to my goal. And I made it! 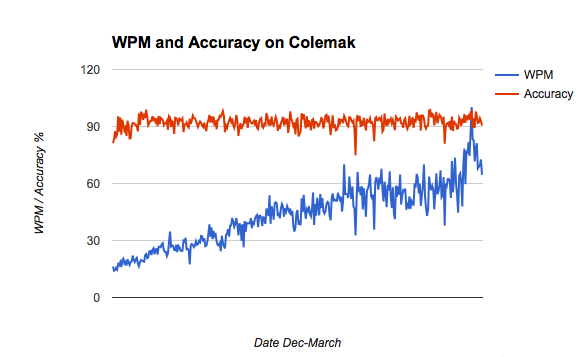 What I didn’t realize was how painfully slow 50 WPM was. I went back to work and struggled with the Swedish characters, remote environments with Swedish QWERTY and symbols. Admittedly, I was under a fair amount of pressure to finish a project, too, which didn’t help. 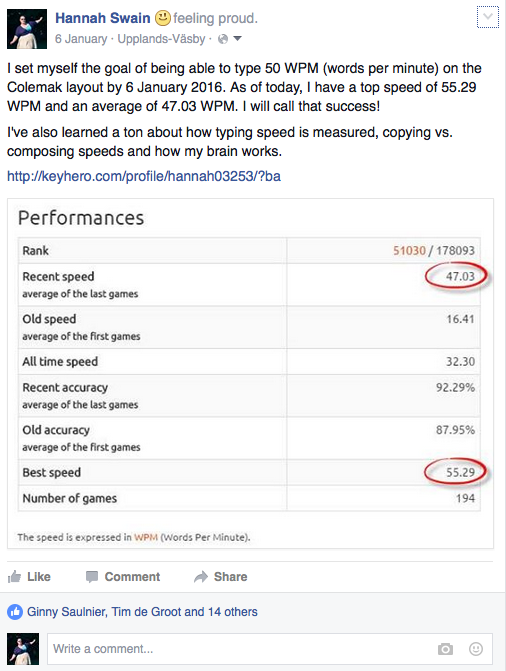 After 50 WPM, I mostly stopped with speed tests, though I occasionally did a few speed tests on Type Racer for the fun of it. 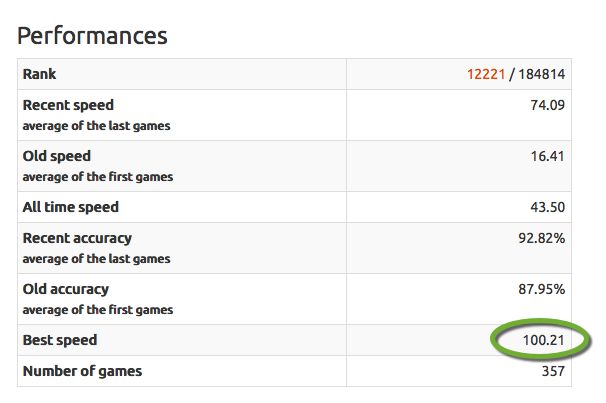 All of this variance tells me that my accuracy has stayed the same, but that my typing speed was highly variable. If I was tired, if it was a tricky piece with lots of weird punctuation or if someone started talking to me – everything affected my typing speed. This says that I had a sharp increase in speed over the first few weeks, but that the speed increas has been a lot steadier after the first month. I’d be curious to come back to this in six months to see if it levels out or not. I do think that getting the habit of caps lock for the backspace has made a big difference. I’m not the most accurate typist, but I can correct myself quickly enough that I’m still fast. Being able to reach the backspace button quickly must have made my corrections more efficient. It’s interesting to see just how far I’ve come. I tend to type at about 70-80 WPM when composing and hit 100 WPM today for the first time on a speed test.